Left: Noel Peverill aged 16 1924. Image: Courtesy Scotch College. Although he was christened Ralph Noel Peverill soon after his birth at Rushworth, Victoria in 1907, Noel Peverill thereafter preferred his middle name. In 1929 he played one VFL senior match with Carlton, before going on to a distinguished military career with the Australian Army in World War II. 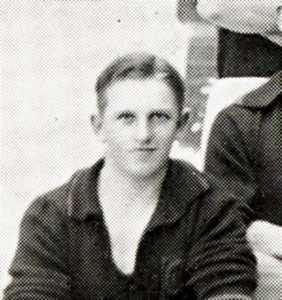 Peverill learned his football as a boarder at Scotch College, and joined the vaunted University Blacks when he began tertiary studies at Melbourne University. In 1928, when the Blacks won another A section flag, follower-forward Peverill had an outstanding final series. Carlton wasn’t the only VFL club that showed keen interest in him, but the close proximity of Princes Park to the university apparently swayed Peverill toward the Blues, and he joined us the following year. Wearing guernsey number 24, Peverill made his senior debut against Hawthorn in round 3, 1929 at Princes Park. He was the seventh new face in the team up to that point, as first-season coach Dan Minogue turned over his list in a search for untapped talent. Peverill lined up on a half-forward flank on that sunny afternoon, and was given a clinical demonstration of forward play. Next to him at centre half-forward, ‘Soapy’ Vallence was unstoppable. He kicked four goals and gave the same number away, while defender Charlie Parsons was supreme across half-back. Carlton had 41 scoring shots, and thrashed the Mayblooms by 38 points. That must have been an exhilarating experience for the young man, but sadly there was to be no more. For reasons that will probably never be known, Peverill and the Blues parted company soon after that memorable afternoon. He went back to his studies, and Carlton went back to the routine of making, then losing finals. It would be almost a decade before the Blues claimed another flag – under Brighton Diggins in 1938. By then, Noel Peverill had graduated, and was an officer in the Australian Militia (or Army Reserve). In September 1939, World War II began when Australia joined Great Britain in declaring war on Germany. Within a year, Peverill had transferred to the regular army and volunteered for overseas service. But his experience with the Militia saw him initially posted to Darwin. He spent two years in northern Australia preparing for a possible invasion, and later served as a staff officer as the Allied forces drove the Japanese from the island of Bougainville. Peverill returned to Australia in 1944, and was eventually discharged with the rank of Lieutenant Colonel. He settled back into civilian life, and passed away in October 1997, at the age of 89. "Noel Peverill, the well known Korumburra golf champion and ex Carlton and University Blue footballer, also co-founder of the South Gippsland tennis pennant, is now a captain adjutant in the A.I.F." Contributors to this page: blueycarlton , Jarusa , molsey , pblue , PatsFitztrick , tmd1 , p(12)terg and admin . Page last modified on Tuesday 04 of April, 2017 13:41:14 AEST by blueycarlton. 1988 Rd 20 - Stephen Kernahan.